Scottsdale Christian Academy is pleased to announce the 2018 SCA Golf Classic to be played at the Arizona Biltmore Golf Course on Thursday, December 6, 2018. The golf classic is a charitable tournament to benefit the mission of Scottsdale Christian Academy to maximize the God-given potential of each student, preparing them to live lives of distinction by impacting the world for Jesus Christ. SCA strives to provide the highest quality of education with full immersed biblical integration in every classroom. The format of the tournament will be a Team Scramble with your foursome. Check-in will begin at 7:15AM with a Shotgun start at 8:00AM. 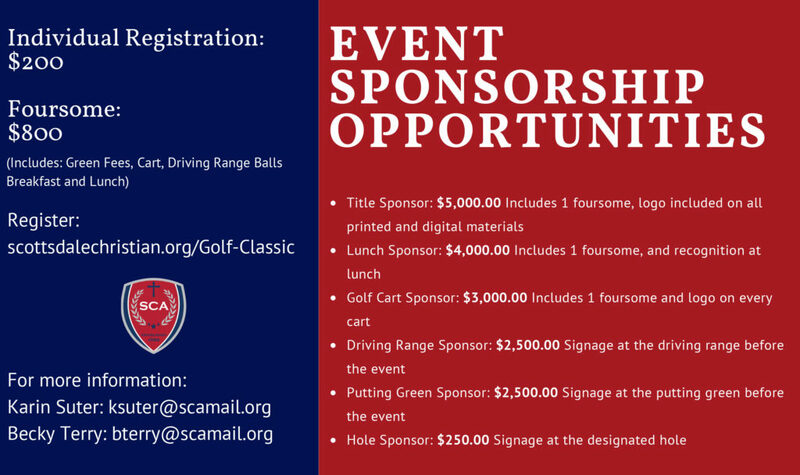 If you have questions about the 2018 SCA Golf Classic please contact Karin Suter (ksuter@scamail.org). We are currently seeking sponsors and players for this year’s golf classic. Please complete registration form below to register for this event.